I've been doing some research on the Prophecy lately. From @Horton reviews I understand that the 2013 one seems to be more user friendly than the 2012. So what about the Connelly Prophecy 2014 ? Are there any improvements compared to the earlier model ? The 2014 has a red base instead of orange. To me that was an improvement since my favorite color is red. Otherwise the 2014 is the same as 2013 (so I've been told). @TallSkinnyGuy and don't forget the badass carbon fiber look with the small red Prophecy badge. It is my understanding that '13/'14 are the same skis with different colors. I wouldn't mess with the '12. '13/'14s are better and more forgiving skis. I rode a '13 for a little while. Really like it, but it was a little small for me when I dropped to 34mph. I really like the look of my '14 Prophecy. I ski with a guy who has a D3 Quest from a couple years ago -- the graphics are horrible on that ski and he was quite envious of mine when he first saw it. I have a 2014 67 that I would like to sell. As a Connelly guy, I was told that there was no difference between the two skis other than the color. I owned both. The 14 red bottom Prophecy was hands down the best ski I ever owned. Until, of course, the GT. The GT turns on a very tight radius with little to no tail slide on either side. You have to work hard to blow out the tail. It then accelerates like nothing I have skied on before. The teal 2016 ski is stiffer in the tip than the orange 2015 that I am riding, and I think that will allow you to ride with the bindings a little further forward to better engage the tip of the ski, thus further shortening the turn radius. The thing I like best is that the ski always finishes in front of you, as long as you don't bring your upper body forward in the turn. As long as you stay off the tip, the ski has no quirks and is very stable. The 2016 may allow more tip pressure, but I haven't skied on one so I don't know for sure. More and more top skiers are looking at Connelly. After years on Goode, April Coble is on the orange GT this year. I heard that another very well known athlete/coach under contract with another company took a ride on one and loved it. "I got my off side back" was the comment I heard. Lex Brumingen loves his. Jeff Volmrich is hoping to have a break out weekend at the Pro-Am this weekend on one as well. And of course there is Joel Howley. When I got my 67" GT the charts said 160-190 pounds for a 67. Now the charts says up to 180 pounds for the 67"
I´m at 190 and the ski always felt small to me, skied fantastic when all things are going well, too unforgiving when the pass went south. This new size chart explains alot, should have tried a 68. I have 10-15 sets on the ski, looks brand new, will travel to Florida late March. Any reasonable bid and I will bring it (live in Sweden). No more sets will be skied on this ski until then. @Mo2204 The tip is a little stiffer on the teal colored ski. @DanE Always choose the longest ski you can turn. I overlap on the size chart between the 67 and 68. I ski the 68. I had an equipment issue at a tournament a few years ago and had to borrow a ski. I was on a 68 Prophecy that I loved, and borrowed a 67 Prophecy. Set it up like I wanted it. Hated it. Went right back to the 68. If you are having problems on the GT, move your binders back 3/16ths and set the wing at 9 degrees. Don't bring your shoulders forward in the turn and you should be fine. I had trouble getting the GT dialed in, but it works great now. @lpskier Well, that depends on the particular ski imo. Sure, @ 28 and 32 off longer skis feel easy but @ 35 and shorter I do not want any excess lenght. In this particular case I,m off the chart to begin with. This is a small 67" ski. Have my bindings @ 29.125 and the ski really feels great when Ì'm on, not much I can do about the size. When I make a mistake (boy, do I make mistakes) it becomes a lot of work. Wish the size charts was dialed back when I got it. You can make a longer ski turn like a shorter ski, but you can't make a shorter ski accelerate like a longer ski. There are skiers, like my ski partner, a former open skier and now an MM skier, who should be on a 67 but rides a 66 because he likes the feel of the turn. He tends to ride the tail of the ski, so maybe that is part of it. Ride what is right for you, but to find out what is right you have to ski lots of skis and lots more fin settings to find it. If you want a good rule of thumb, ride the longest ski you can turn whether you are -15 or -39. I assume the rule is true for -41 and shorter, but CP, Nate, Freddie and Joel might be better sources of information than me on those line lengths. There was a time you only had 64, 66 and 68" skis to choose from. Back then a 185 pound skier always had to be on a slightly larger or smaller stick than ideal. Nowadays we can match the size better since there are 65 and 67s. Most brands 67 is my size but this particular brand is a small 67. 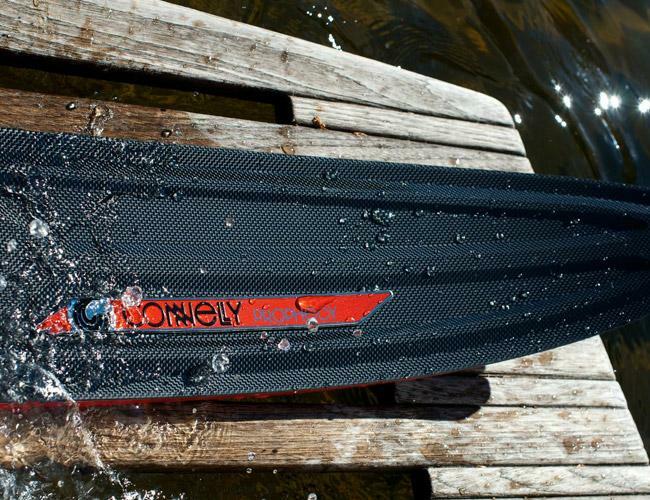 I am looking for a Connelly Prophecy 66". Wondering if anyone has one they are thinking of selling or know of anyone with one.